I’d been playing around with all sorts of eyeliner and eye lining lately. I previously offered some tips on how to apply gel eyeliner. However, lately, I’ve been toying with tightlining, or lining under the lashes instead of over. I’ll write more about this technique later. I came across the Guerlain loose kohl and I was intrigued. Kohl has been used by the people in the Middle East for centuries, to line their eyes and to create the dark mysterious look of the East. Apparently, it is good for the eyes which is why they use it – other than the fact it emphasizes their large eyes of course. Guerlain came up with loose kohl in a little tube that is supposed to have the same properties that traditional kohl has and which is supposed to do the same thing that kohl does for your eyes – line them. 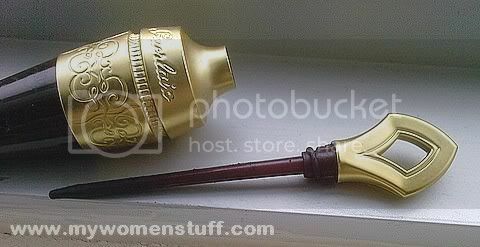 Guerlain’s loose kohl comes in a little ornate tube. Mine is in Noir (Black) and the bottom part is a solid colour so you can’t see how much is left. The top is a beaten metallic gold colour with engravings. It all looks very eastern and exotic and mystical. It is however just about the size of a lipstick. Just the little bit at the top unscrews to reveal a slim stylus that is the applicator. It is just about as slim a stylus as you will find in your PDA. You use this stylus to apply the kohl on your eyes and it is supposed to make it easier to apply especially on the lower lashline. A little paper pamphlet comes with the tube of kohl with instructions on how you can use it. According to them, you can use it in the Eastern way or Western way. The Eastern way of using kohl is to apply the stylus on the inner edge of your lower lash line, close your eye over it, and pull the stylus all the way out to the other end. It leaves both your upper and lower lash line lined with kohl. It looks all complicated (and believe me, it is!) so I have found a very useful Youtube video that teaches you how to apply the Guerlain Kohl using this Eastern method. I tried it this way and I failed dramatically. I ended up with kohl powder all UNDER my eyes and even got some on my eye itself. I was very worried about that. The next time I tried, I got it all UNDER my eye (panda eyes anyone?) but none on my eyeball so I guess that’s improvement? 😛 However, try as I might, I decided I looked really mean with my lower lash line lined, whether half or full, so I decided I won’t do it anymore. The Western way of using the loose kohl involves you using the stylus to line all around your eyes like as if you are using a pencil. Lightly dab the stylus on the lash line and connect the dots to line the eyes. It works too. I tried this one and found it easier but I still had a lot of fall out under my eyes. In the end, I’m using the Guerlain loose kohl my own way. Lightly shake out the stylus when taking it out of the bottle. This is so that you shake off the excess kohl powder and there is a lesser chance of it falling on your face. Slightly angle the stylus, lift the upper lid slightly and apply the stylus to the lower part of the lid i.e. under the top lashes, and pull it towards the outer end of the eye. I get an intense dark line this way that makes my lashes look thicker and my eyes look bigger. This is the basic concept of tight lining. Here’s a picture of how my eye looks with the kohl used as tight lining. It isn’t very obvious in pictures and therefore looks natural and your eyes naturally look bigger and lashes look thicker. Its an awesome technique. Despite it being a powder kohl, I find that the lasting power on this kohl is amazing. It literally lasts the whole day on my lash line. Considering the amount of blinking I do everyday, its a wonder it isn’t all washed away by tears! However, application is always touch and go. One some days, I get loose kohl all under my eyes spoiling my makeup, and on other days, I get a perfect fuss free line. The best way I’ve found is to do my lining first, then do the concealer and foundation for the face. This way, I can wipe away all the loose kohl and still have a presentable face. As I don’t line my lower lash line, I do find that it runs a little into my lower lash line throughout the day giving a subtle smokey eye look if I don’t clean it off periodically. Not too bad a look if you can pull it off. I reckon this would make a good liner for use with a nice black smokey eye. Because it runs a little, I’ll dock some ratings for that. Some people have said that it doesn’t even budge on them. 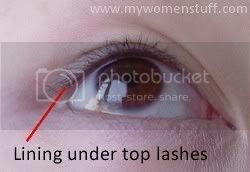 I suppose its true to an extent but it is noticable if you only line one lash line like I do. If you line both, then it makes no difference. I was previously tight lining with 2 items – black eyeshadow and Make Up For Ever eye seal which I will review later. This Guerlain loose kohl cuts down the step by one which I appreciate. However, I don’t appreciate it so much that I will re-purchase simply because I can’t get it to work properly for me. About the packaging, although its very pretty, I am a little wary about sticking the stylus back into the powder every time I use it, so I make it a point to clean it off with tissue after I use it. However, I suppose its much like a mascara and according to the packaging, the shelf life once opened and used is 6 months. Because it is so near your eye I’d stick to this 6 month rule and like mascara, never share your stylus or loose kohl with anyone else. The Guerlain loose kohl comes in 3 colours – Black, Blue and Purple. I’m not sure how much this Guerlain loose kohl retails at our local Guerlain counters as I bought mine on StrawberryNET.com for US$23. If you perfect the technique, its worth checking out. PREVIOUS POST: Revlon Foundation Giveaway – Results! Oh cool, the packaging is to die for. But I don’t own a single guerlain item due to the steep pricing. Tightlining is so difficult!! Thanks for all the tips and tricks! Will need to keep practising! Monstro: Its so pretty right? But nope! I can’t get it to work! I’ll try to write about how I tightline later. Its not hard once you get the hang of it and have the right tools.